In this paper ex ante inequality measure is used to estimate inequality in childhood chronic under-nutrition among different vulnerable subgroups. Results found that vulnerability to consumption poverty aggravated chronic under-nutrition among less vulnerable groups mainly among those who perceived that unqualified providers provided quality service and were very effective during crisis.The paper finally suggests several policy suggestions for different vulnerable segments. The application of systems thinking in health: why use systems thinking? This paper explores the question of what systems thinking adds to the field of global health. Observing that elements of systems thinking are already common in public health research, the article discusses which of the large body of theories, methods, and tools associated with systems thinking are more useful. Following a range of trainings – on how to use digital cameras, how to approach a picture subject, and getting people’s consent – study participants used the cameras provided to them to capture aspects and situations in their community where youth can contribute to improving maternal health for a period of five months. Monthly meetings were held between the youth and research team to discuss the photos and to identify collectively emerging themes and areas for action. Working with several women’s groups in the Sundarbans, FHS provided a range of trainings – on how to use digital cameras, how to approach a picture subject, and getting people’s consent – to study participants. In turn, the participants used the cameras provided to them to capture images that explain how a changing climate affects their daily livelihoods, barriers that exist to accessing health services, and ways that locals are adapting to these challenges. This presentation is from a workshop in Baltimore in June 2014 on complex adaptive systems (CAS) research methods held at Johns Hopkins University. In this presentation, Ligia Paina from the Johns Hopkins Bloomberg School of Public Health shows how to use the computer program Vensim to develop Causal Loop Diagrams (CLDs). This presentation is from a workshop in Baltimore in June 2014 on complex adaptive systems (CAS) research methods held at Johns Hopkins University. In this presentation, Agnes Rwashana Semwanga gives an overview of two case studies where the Causal Loop Diagram methodology has been applied to health systems research. This presentation is from workshop in Baltimore in June 2014 on complex adaptive systems (CAS) research methods held at Johns Hopkins University. Agnes Rwashana Semwanga from the Makerere University School for Public Health (MakSPH) introduces the basic concepts of how to create causal loop diagrams (CLDs) as a tool for modelling complex health systems. Based on a household survey in Indian Sundarbans hit by tropical cyclone Aila in May 2009, this study tests for evidence and argues that health and climatic shocks are essentially linked forming a continuum and with exposure to a marginal one, coping mechanisms and welfare outcomes triggered in the response is significantly affected. DC HSB Event Video: Can systems tools deliver for the 'science of delivery'? This is a video from the DC Health Systems Board event, Can systems tools deliver for the 'science of delivery'?, which was organised by Future Health Systems as part of its workshop on complex adaptive systems and held at Results for Development in June 2014. At the event, panellists discussed and debated how systems thinking tools that are designed to tackle issues of complexity can contribute the successful implementation of health system strengthening interventions. The panel showcased some tools and examples, explaining how they had helped them to understand better health systems fluctuations and to anticipate unintended consequences to create more sustainable large-scale interventions. Every year, the ministry of Health (MoH) commemorates the Safe Motherhood week in October. The national commemoration this year (October 2013) was held in Apac district in Northern Uganda. As part of the events for the week, MoH and its partners held a symposium on the theme: “Teenage pregnancy an obstacle to maternal health; let us stop it now!”. This report therefore contains proceedings of this symposium that attracted safe motherhood partners from across the country. Teenage pregnancy is a major issue for maternal health and partners in the area of reproductive health came together in this symposium to share their experiences and most importantly to discuss how they could individually and collectively make better progress in addressing the challenge of teenage pregnancy. 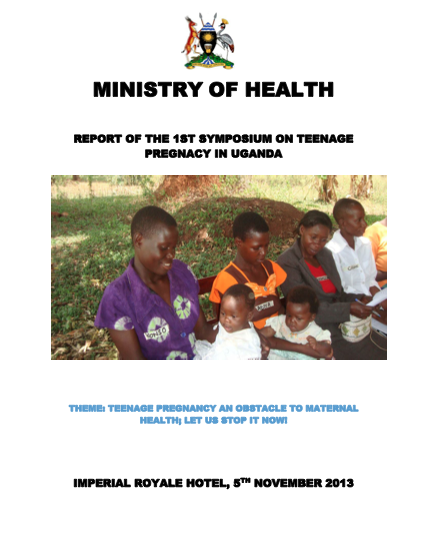 In this report you will find discussions and useful insight on the problem of teenage pregnancy, its magnitude in Uganda, as well as the interventions that are being undertaken. You will also find challenges to its control as well as recommendations by different stakeholders on what needs to be done to tackle the problem in a more effective way. Rural households in India rely extensively on informal biomedical providers, who lack valid medical qualifications. Their numbers far exceed those of formal providers. Our study reports on the education, knowledge, practices and relationships of informal providers (IPs) in two very different districts: Tehri Garhwal in Uttarakhand (north) and Guntur in Andhra Pradesh (south). Roundtable discussion: what is the future role of the private sector in health? The role for the private sector in health remains subject to much debate, especially within the context of achieving universal health coverage. This roundtable discussion offers diverse perspectives from a range of stakeholders - a health funder, a representative from an implementing organization, a national-level policy-maker, and an expert working in a large multi-national company - on what the future may hold for the private sector in health. The rapid evolution and spread of health markets across low and middle-income countries (LMICs) has contributed to a significant increase in the availability of health-related goods and services around the world. The support institutions needed to regulate these markets have lagged behind, with regulatory systems that are weak and under-resourced. This paper explores the key issues associated with regulation of health markets in LMICs, and the different goals of regulation, namely quality and safety of care, value for money, social agreement over fair access and financing, and accountability. Using data from a household survey in West Bengal, the purpose of this paper is to identify the relative risks of catastrophic healthcare expenditures for different types of health need, and the impact of such expenditure on household coping strategies. It concludes that Catastrophic health spending is an important problem for the population in West Bengal. More attention is needed on the poverty-inducing effects of long-term expenditures on chronic illness, given that existing schemes only address hospitalization.